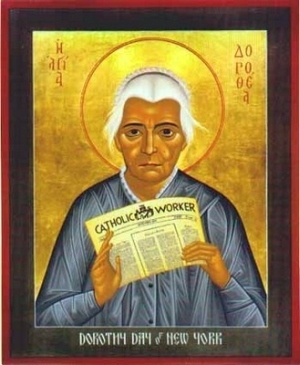 Dorothy Day (1897-1980) began her adult life as a socialist seeking religious truth and ended it as a Catholic influenced by socialist ideals. Born in Brooklyn and raised in Chicago, her early adulthood included work as a progressive journalist reporting on social issues of the day. In November 1917 Day went to prison for being one of forty women in front of the White House protesting women’s exclusion from the electorate. 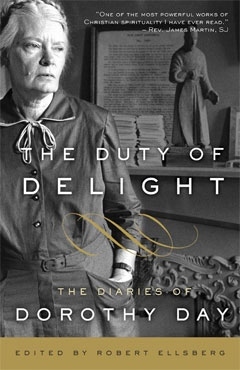 In 1927, following the birth and baptism of her daughter, Day was received into the Catholic Church and became committed to using Catholic teachings to fight poverty and social injustice. In 1933 in New York City, she co-founded (with Peter Maurin) the Catholic Worker newspaper that advocated pacifism and positive social action. Day opened homeless shelters across the country and later led movements protesting nuclear war, militarism, and racial bigotry. 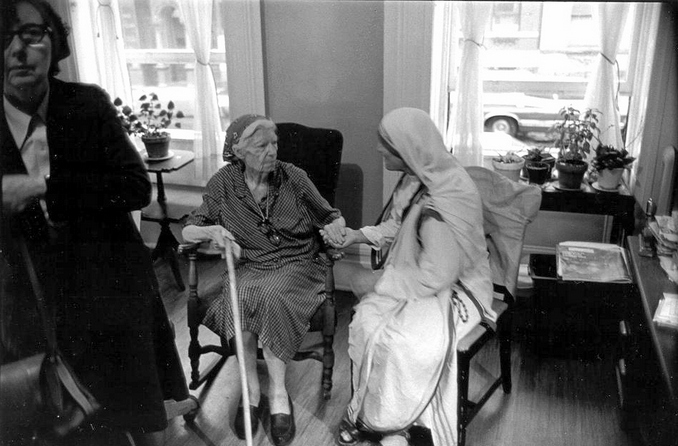 Dorothy Day took seriously Christ’s command to be responsible for our neighbour. She was a fool for Christ’s sake: her boss was the individual on the street who was forgotten by society, the one we see each day, the one on the park bench who smells of alcohol and urine. Young Marxist journalist in Chicago, she became a beacon to both the poorest of the poor and the Christian community: we are called by Christ to respond passionately, Day understood the urgency of His call. Inspired by an itinerant French philosopher and farmer named Peter Maurin, Day set up Houses of Hospitality to help feed, clothe, and comfort the poor – the very basis of Christianity, lived through the Beatitudes. Her basic message was stunningly simple: we are called by God to love one another as He loves us. If “God” was one key word, “hospitality” was another. She repeated again and again a saying from the early Church, “Every home should have a Christ room in it, so that hospitality may be practised.” Hospitality, she explained, is simply practising God’s mercy with those around us. Christ is in the stranger, in the person who has nowhere to go and no one to welcome him. “Those who cannot see the face of Christ in the poor are atheists indeed,” she often said. For all her travelling, most of Dorothy’s life was spent in New York City. Before her conversion, in 1924 when she was 28 years old, she had bought a small beach house on Staten Island that remained part of her life until she too weak to make the trip any more. It was a simple structure with a few plain rooms and a cast iron stove. Walking on the beach or to the post office, rosary in hand, she prayed her way through an out-of-wedlock pregnancy, prayed her way through the Baltimore Catechism, prayed her way to her daughter Tamar’s baptism in a nearby Catholic parish, prayed her way through the collapse of a common-law marriage and to her own baptism, prayed her way through the incomprehension of her atheist friends who regarded all religion as snake oil. Years later it was mainly in the beach house that she found the peace and quiet to write her autobiography, The Long Loneliness. What I want to do is get a job, in some hospital as war-maid, get a room, preferably next door to a church; and there in the solitude of the city , living and working with the poor; to learn to pray, to work, to suffer, to be silent. The world is too much with me in the Catholic Worker. The world is suffering and dying. I am not suffering and dying in the CW. I am writing and talking about it. … I have always been so sure I was right, that I was being led by God—that is, in the main outlines of my life—that I confidently expected Him to show His will by external events. And I looked for some unmistakable sign. I disregarded all the little signs. I begin now to see them and with such clearness that I have to beg not to be shown too much, for fear I cannot bear it. I need strength to do what I have to do—strength and joy and peace and vision. We feel so powerless. We do so little, giving out soup. But at least we are facing problems daily. Hunger, homelessness, greed, loneliness. Greatest concern of the bible is injustice, bloodshed. So we share what we have, we work for peace. Awoke in great misery. Board of Health threatening to close us. Letter from Della yesterday and a gift. “Love is an exchange of gifts.” (Where did I hear that?) What a joy to say the Gloria in happy moments and the Credo when in need of reassurance and the Ave Maria too with its conclusion, “Now and at the hour of our death.” The Eastern churches know the value of repetitious prayer. I remember the first radio I had in the early 20s, constructed for me by Willy green, a 12 year-old boy, out of a cigar box, a crystal and a bit of wire, an aerial and earphones. Manipulated properly, from my seashore bungalow in Staten Island, I could hear a presidential campaign, Saturday pm. broadcasts, football, and miracle of miracles, symphonic music. That little radio was a miracle box. I could not understand it. If this is possible, anything is. Planting a garden, reaping a harvest … Having a baby, the greatest miracle of all. So I could take on faith the truths of Christianity, the Church, the sacraments. My heart swelled with gratitude. Faith came to me just like that, and the need to adore. I could not understand the mechanism of that little box with its crystal, set like a jewel to be touched by a bit of wire. It was a miracle to hear voices of people in conversation, a symphony orchestra playing Beethoven. If I could not understand scientific truths, why should I worry about understanding spiritual truths of religion? I wanted to say yes, this is true. Across the street from my window on E. Third St. is a sycamore tree with a few little seed balls hanging from it. When I first get up and sit by the window, the rising snow at the foot of the street has made it a golden tree and during the heavy snows a tree white and gold, a joy to survey. I begin my a.m. prayers with thanksgiving.